So tranquil, so verdant, a perfect sphere of greens, blues, turquoise. A blink, the capillary flow of gore and black, superimposed chemical death and hellfire. Capital punishment of a system. Death, death, death. Thousand fold smiting of my soul. Love. To so deeply care of his subjects. To do the God Emperors bidding. To murder a billion to deny the witch. To stand naked against the warp and prevail. To wear the armor of contempt and go to war with the unborn. Hate. No remorse. So strong it makes me. It makes us. Sinners and Saints in equal measure. Crusaders. Believers. Utterly focused. We are the Emperor’s light. Blinding ruthlessness. 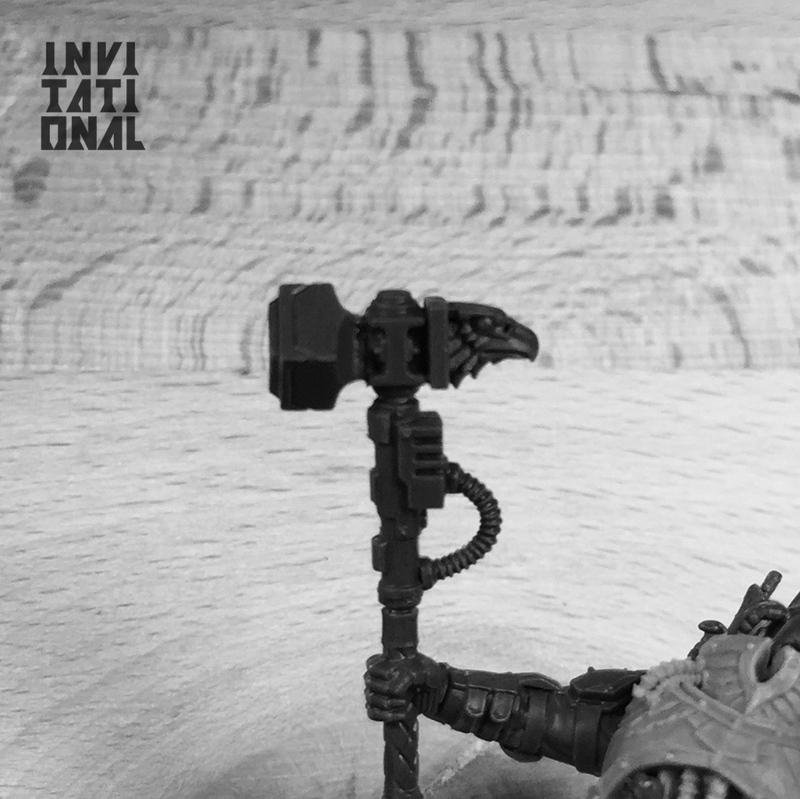 If there was a body of work that defined what my little legacy for the hobby might be, it would be the Good, the Bad and the Ugly – the Inquisitor Trilogy. Starting with Shaddes offe Greye, the Ugly – a study to the endless grey that is the worlds of Warhammer 40000 and trying to create models matching the raw creation of Blanche’s illustrations. It also helped create the +I+munda movement as we played a splendid campaign called the Jade Vessel. A twisted Necromunda that became a beacon of sorts for hobbyists wanting to enjoy the inquisition from modeling to gaming. This was followed by the Red Storme Riseth, the Bad – pushing the envelope towards radicalism and painting a storm of blood, gore, and despair. 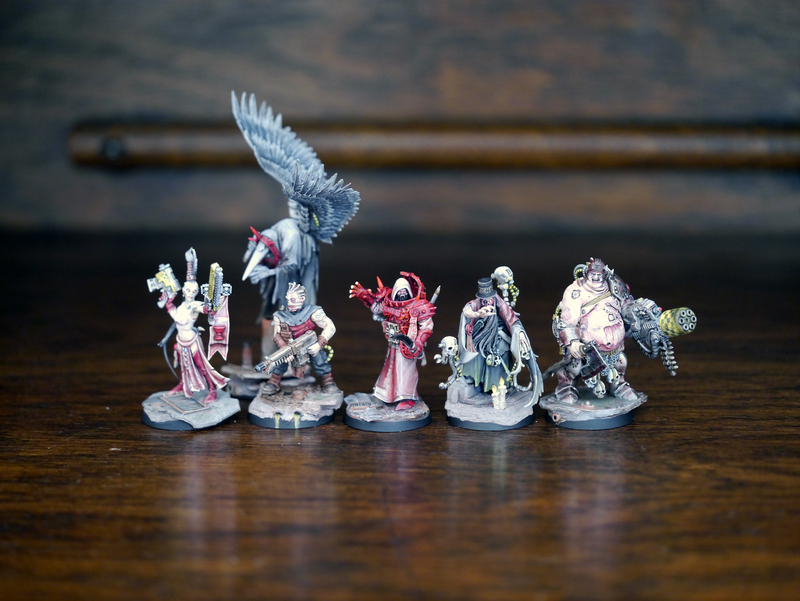 My first paint job of Alban Silas (pictured below with his motley crew), the rogue Inquisitor, had been a smooth disaster, and it was as if devil took over and dropped a can of blood on him and the second coming still remains my favorite model. The terrible, blinding embrace of the Emperor of man. Noble, honorable, an institution. Lord and model of the Ordos. Utterly without remorse. Inspired in equal degree by Roman Catholic Churches, the Orthodox Catholic Icon art, painted on gold canvas, Adrian Smith’s classic, over the top imperial and armored Inquisitors, my friend Neil and finding the exact polar opposite to the first two parts. I want to study the role of religion, the Ministorumme, and not the usual route of preachers and priests, but of Emperor’s blinding power and belief in a Lord Inquisitor, in a very very powerful witch. And perhaps a leader of a movement within the Inquisition. A paradox of the kind that makes the Warhammer 40000 universe. Idea (painting this vibrant, translucent, smokey, yet shiny, almost light emitting gold) is a few years in the thinking, but has also recently gotten a nice proof of concept in the collector edition seventh edition Warhammer 40000 cover art. Which is somewhat similar to how I had imagined the models to look. It has also required finding the Scale 75 metallics and learning to use an airbrush (latter less so than the former). I started on 3 different Inquisitors during the years between Silas and now, and was dissatisfied. None felt like a dystopian version of the church, armed with the power of the warp, until a certain Forge World model caught my eye. And of course, the Invitational, a perfect “excuse” to give Vlka Fenryka a brake and dive in the deep end. The end result will likely be half a dozen models, but starting with three and using the challenge as a good driver to give the group nice variation and strong identity. I present to you three little teasers. The Inquisitor, the Commissar and a heavy stubber system. 25, 40, 60mm bases respectively. And a whole lotta detail, candles, skulls, parchments, seals, to go in… I have some VERY interesting “character” concepts in development too. Smells like some awesome stuff ! Can’t wait to see the heavy stubber system… An ED209 like for 40? Something like that, but also as if the organs walked out of a catholic church and integrated with a bulldozer. Hi folks! My first appearance on this blog so first I must say how inspiring all this stuff here is. As well as this project here again looks very promising. But to me these black and white pictures seem kind of impractical to show WIP. If it’s not just for teasing. Most materials we use are grey anyway, but what about the greens? Yeah, I get your point. It’s a matter of taste of course. Steeling kits is smart! I always wondered how you can afford all this… Watch your back! They are obviously stolen from 1/35 models I’ve purchased that I can no longer assemble as parts litter my basing. Whoa. I fear my english is too bad to understand your answer properly. Of course I was just joking about you stealing models literally. Not my best one I guess. Hope you understood me right. Anyway! I’m looking forward so hard to see more results of your invitational. Especially the true-scale Space Marines! In fact that whole true-scale thing brought me back into the hobby after being out for 12 years or so. Damn, I love it! Keep on modelling! I am fan! Great hammer. Legion praetor torso right? Replacing the legs on the commissar is also a shrewd move, they were the worst part. Yes, the Terminator one – suitable for a properly power armored Inquisitor torso when my marines are the “right scale” 🙂 Thanks! The new legs should give the model a much better sense of movement. I think the padded leather look of the Elysian models lends itself really well to the swinging jacket and sash. Looking forward to seeing the third band come together. the Aquila are certainly teasing up a storm… a red storm rising perhaps? 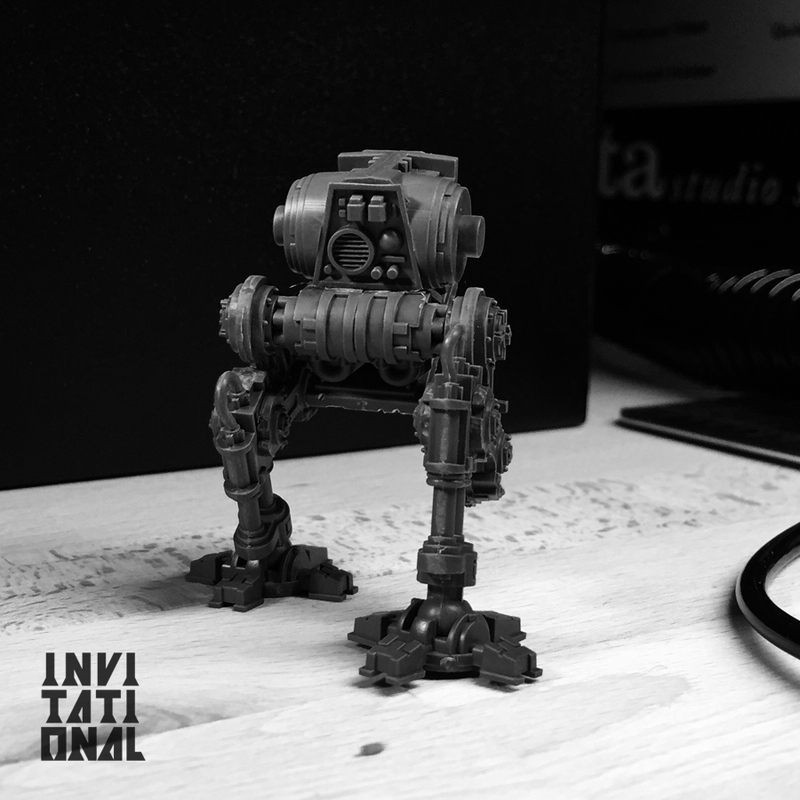 Lovely WIPS as always Migs – nice to see you back with the Inquisition. Extremely exciting stuff you have here! Your two other Inquisitor bands have been an incredible inspiration, and I cannot wait to see where this one goes. It is a bit too early to really make any significant comments (curse your careful cropping! ), but i like the direction you are heading. 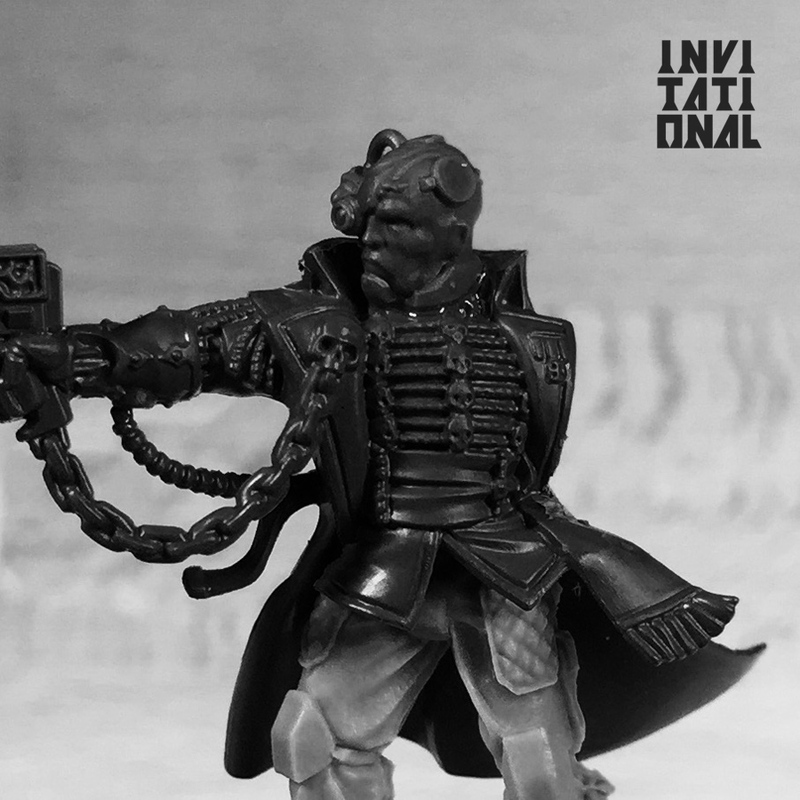 I might suggest replacing the chain on the commissar with something a bit finer; as it is, each link is about the size of his fist! Great point about the chain! !